After almost two years, I've finally learned how to use my camera! Well, use it better. No, this post does not include my newly learned skills, but it did push me to learn how to use all those little buttons on my camera. I've been quite unimpressed with how my camera has been functioning the past few weeks- so frustrating taking photos that look fine in the display but are lackluster on screen. I contemplated an upgrade, but it turns out my issues might have been more user than camera related. Anyway, back on topic, yes? 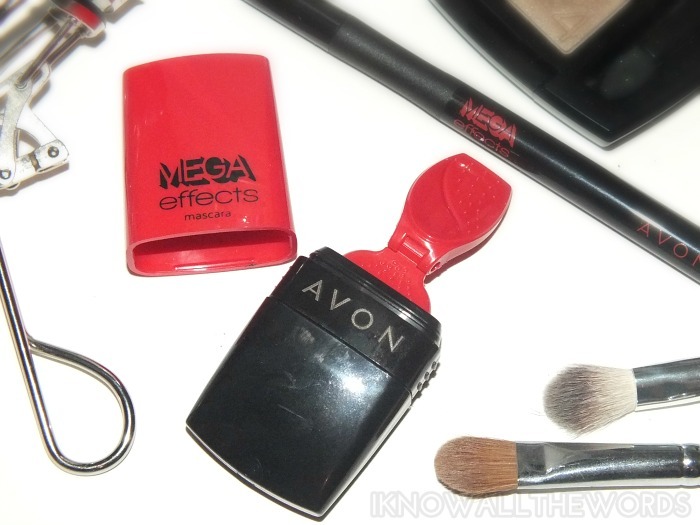 Avon has recently released a Mega Effects Liquid Eyeliner to go along with their massively popular Mega Effects Mascara. I've been using both and am kind of in love! Read on! Since it's original release, the Mega Effects Mascara has been very popular- it's been hailed as the hottest mascara breakthrough in 50 years, and made Flare magazine's 12 beauty innovations of the year. What makes this mascara so fascinating is... well, everything. It's housed in a rectangular packaging which is home to the paint brush style applicator. 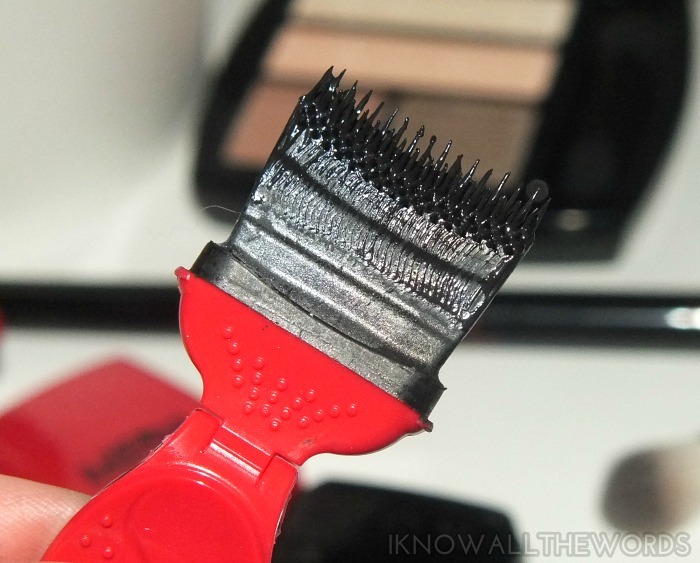 It does look a tad dangerous when you first lift it to it's eye- it's got spiky little silicone brushes- but the curved shape is designed to fit the natural shape of lashes. The brush works to coat every lash evenly and perfectly from root to tip, and claims to apply more than 40% more mascara to lashes. So, how does it work? Pretty well! The formula of the mascara is a little wet, so you do have to be careful to avoid smudging when applying, but I do think this will improve once it 'matures' a little- I'm using a fresh one that hasn't been open long. I found the mascara applied easily and didn't clump on lashes, which means you can really layer it up for the best effect. It is best to have a lash comb handy though, as I found that more layers did make my individual lashes stick together more. Of course, the natural mate to mascara is a little liner- especially liquid, and the blacker the better. 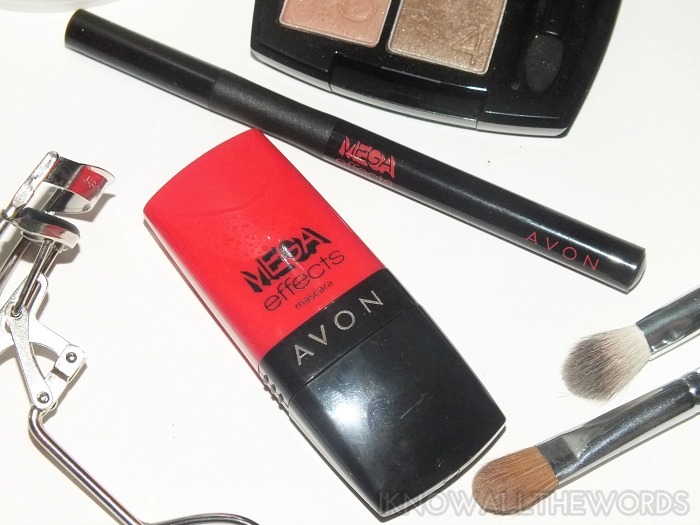 To pair with their Mega Effects Mascara, Avon has released the Mega Effects Liquid Eyeliner (remind you of this a bit?...) 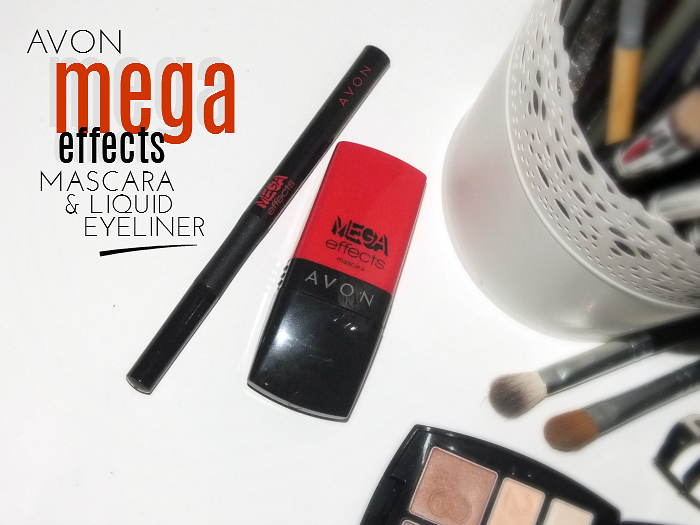 I use Avon's Extra Lasting Liquid liner pretty frequently, so I was really interested in seeing how well this wears. 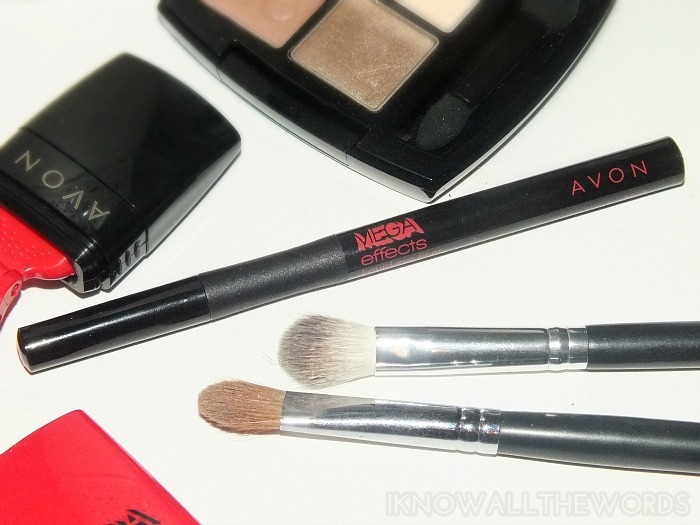 Avon tends to prefer the nib and ink style liquid liners, but the pen style is so much faster to perfect- especially if you're still new with liquid liner. I found the nib on this to be quite nice, as you can use the side for a thicker line or the tip to get a super fine one. I did find that the nib took a little bit of time to adjust to as it didn't flow easily on skin- it wanted to skip a bit. Once you get the used to the tip though, this makes liquid liner incredibly easy. 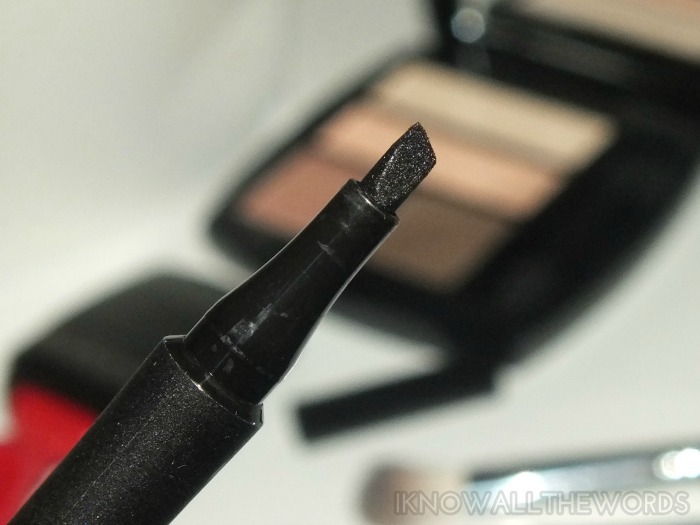 The angled nib is perfect for getting your flick angle spot on (just follow where your lower lash line would go if it kept going up) and gives the perfect matte black line. The liner is opaque in one pass and doesn't feather or migrate on skin so you get a crisp line. 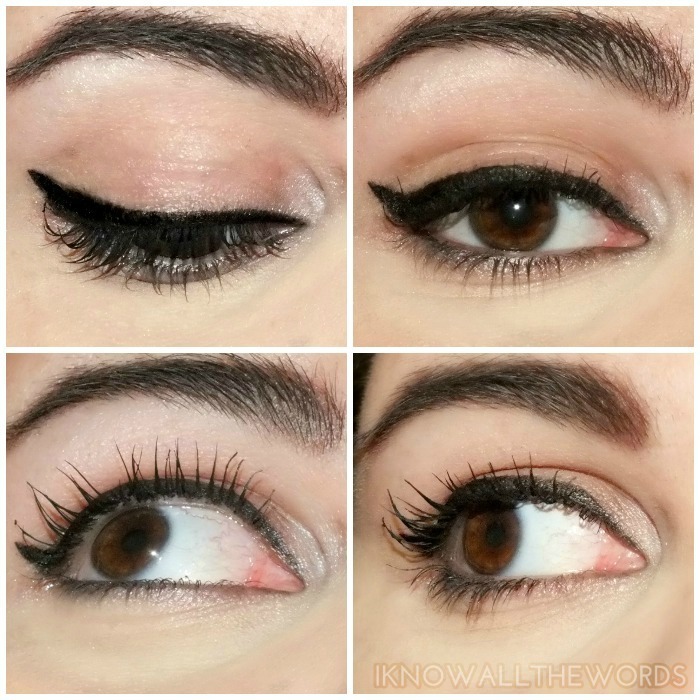 The liner not only looks great, but it wears amazingly well all day. It doesn't smudge or shift and will even last through a little nap. It doesn't claim to be waterproof, but it lasted on me all day, even through an allergy day where my eyes were constantly watery. Removal is easy too- any remover seems to work! Overall, I am a fan! 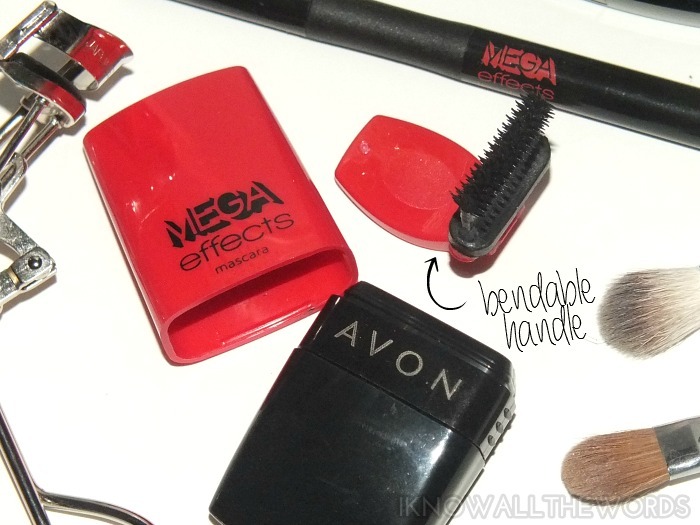 The mascara could have ended up a gimmicky mess, but it actually does work well. The liner is my favourite of the two as it's just so easy to get the perfect line quickly. Have you tried either? Thoughts? What's your go to liquid liner?